Conveniently located across from Grand Central Terminal and blocks from major hotels like The Westin and Hyatt, Davio’s is a restaurant that dazzles the taste buds. After finding success in Atlanta, Boston, and Philadelphia, owner and restaurateur Steve DiFillippo is now taking NYC by storm with what is sure to be a new city staple. A 2008 inductee into the Massachusetts Restaurant Hall of Fame, his new book, “It’s All About the Guest” chronicles his journey, philosophy, and what it takes to run a successful business. NYC Monthly was honored to speak with him recently. NYCM: Tell us a little about Davio’s. STEVE: Sure. We are a Northern Italian Steakhouse,so we do both really well. My soul is Italian – I’m half Italian and half Portuguese – and for the first 17 years of the company we were a Northern Italian Restaurant. Then, about 11 years ago, we decided to get more into the meat business by adding more steak and an a la carte section, so we went out and found the best meat we could find. We use Brandt meat from California; it’s true natural and very expensive meat – it’s the best steak you’ve ever had, I guarantee it! It’s just unbelievable. STEVE: Chicken livers. It might seem odd that we sell chicken livers, but we have a chicken livers dish here that is just amazing. In fact, we probably sell more chicken livers than any restaurant in the country. The dish is a port wine reduction where we crisp up these chicken livers and it’s just amazing. If you like liver, I highly recommend it! 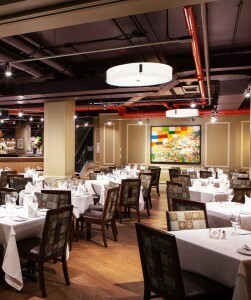 NYCM: What else is unique about Davio’s? STEVE: We make all our pasta here. We’re a scratch kitchen and we have our own bakery and make everything. We make our own bread, our own desserts, our ice cream, our pasta. We have these hand-rolled gnocchi that are like pillows – they’re just so light and fluffy. We also have a few old-school items like meatballs that are my grandmother’s recipe from Italy, and they are so light and flavorful – you would not believe how good these are. NYCM: Would you say the Kobe beef meatballs are also a popular dish? STEVE: Yes, absolutely. And, then we have this other crazy thing that we do here. We make these Philly Cheesesteak Spring Rolls. We started making these years ago back in our restaurant in Philly, and they became so popular that I now have them in all the restaurants and also sell them in stores. We’re selling our products in over 3,000 stores around the country. In fact, next week I’m going on QVC to sell the product. NYCM: Do any celebrities dine at your restaurant? STEVE: We’re known as a celebrity restaurant. All our restaurants are. In fact, Tom Brady and Gisele eat at Davio’s all the time. They now have a place here in New York so, as soon as the season’s up, I’m going to get them over here because Tom wrote a nice blurb in the back of my book. Joe Torre is also a frequent guest. He used to come to our Boston Davio’s when he was managing the Yankees and he’s already been in our location here. NYCM: You seem to have a philosophy that caters to special requests. Is that correct? STEVE: We never say “no”. Some people come in and ask for chicken or veal parm. Now, we don’t have that on the menu, but people come into an Italian steakhouse and they think, “Oh, I’m going to get the veal parm”. When they come in and don’t see veal parm on the menu they get really disappointed and will ask, “can you make a veal parm” and I’m like,”No problem”. And we make a great veal parm! NYCM: Are you thinking about opening more restaurants in NYC? STEVE: Absolutely, I’m not here to do one restaurant in New York. I would hope to do three. And, I think we can easily do that, maybe even more. I’m building this brand, bringing excellent dining, service, and customer experience to NYC.